Environmental campaigners say they believe that cheating similar to what happened at VW is going on in Europe. The German car manufacturer admitted to using a "defeat device" to rig emissions from its cars in the US. But green group researchers told BBC News that their analysis of some European diesel cars pointed to a "different sort of defeat device being used". Industry bodies deny there is any deliberate deception in European tests. While there has been widespread indignation at the scale of VW's manipulation in the US, the number of diesel cars being used across the states mean the impact on the environment and air quality is likely to be limited. But in Europe it is a different story. Over half the cars purchased in the EU in 2014 were diesel powered. 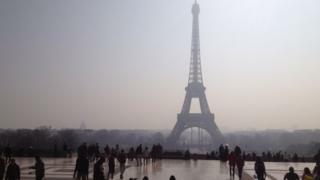 Several European cities, including London and Paris have had significant issues with nitrogen dioxide, a harmful gas produced as a result of diesel use and linked to increased deaths from heart attacks and asthma. But according to the latest research from Brussels-based Transport & Environment, only one in 10 new diesel cars sold in Europe meets the standards for emissions for nitrous oxides (NOx). "New diesel cars should be achieving 80mg of NOx per kilometre, typically an average diesel is producing five times more than that at the present time," said Greg Archer, a former UK government adviser and now head of clean vehicles at Transport & Environment. Testing in Europe is said to be more open to manipulation than in the US because the evaluations are carried out by companies paid for by the manufacturers, and they are generally done before the cars go into full production. Many researchers acknowledge there is widespread "gaming" of the system. "There is a widespread appreciation that there has been gaming going on," Prof Alastair Lewis, from the University of York, told BBC News. "But what VW shows is the extreme lengths to which manufacturers are going, way beyond what a reasonable person would appreciate was an appropriate level of gaming." According to Greg Archer at Transport & Environment, there is much more than gaming the system going on in European tests. "There are car models out there which are 50-60% difference between tests and real world performance," he said. "We think that gaming will give you about a 25% difference, we can't explain how these vehicles are achieving real world performances 50% higher, unless something weird is going on in the way they are being tested, that would point to something similar (to VW), a different sort of defeat device being used." Mr Archer refused to name the manufacturers that he believes are cheating the system in Europe. Motor manufacturers were quick to deny that any organised or deliberate cheating was going on in EU car tests. "The EU operates a fundamentally different system to the US - with all European tests performed in strict conditions as required by EU law and witnessed by a government-approved independent approval agency," said the chief executive of the UK's Society of Motor Manufacturers and Traders, Mike Hawes. "There is no evidence that manufacturers cheat the cycle." Be it gaming the system or outright cheating, researchers including Prof Alastair Lewis say the impact of dodgy data on UK government attempts to clean the air are significant. The UK is currently being prosecuted by the European Commission because of its inability to reduce levels of nitrogen dioxide in many locations to safe levels. "The UK has terrible problems with nitrous dioxide in city centres but the government can only work with the data provided by manufacturers and that has proved to be highly unreliable," said Prof Lewis.